Computers are electical gadgets. That should be obvious, since we need an electrical power source of some kind to make them do anything. If that power source goes away, a computer is a useless pile of physical stuff that can be used as a door-stop! Once we add that power source, magic starts to happen. We power our computers either with a battery, or by plugging it into a wall socket. In either case, that power source provides a pile of electrons that can move through our computer. So what is an electron? This is not a Physics course, so we will not dig too deeply into electricity here. Basically, an electron is a tiny particle that carries a negative electrical charge. There are other kinds of particles in our universe, including protrons, which carry a positive electrical charge (opposite from that carried by an electron), and neutrons, which carry no charge at all. Usually the same number of electrons as we have positrons. The neutrons and protrons are glued together in a mass called the nucleus of the atom. The elecrrons swarm around that nucleus in a cloud. The best way to visualize this is to compare it to our solar system. The nucleus is the Sun, and the electrons are like the planets orbiting around the sun. The big difference is that electron orbits do not resemble a typical picture of our planets that much. Instead electrons live in one of several “shells” each of which contains a number of electrons spinning around at some common speed. These shells are called electron shells. The outermost shell is called the valence shell, and that is where elctrons live that can can interact with the electrons from other atoms if they get close enough together. The electrons we are interested in tend to hang out near those outer rings called valence rings, rather than in orbits closer to the center. It takes energy to move an electron from one ring to another, and more energy to knock an electron loose from an atom. 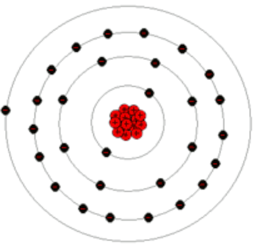 Some atoms will tolerate extra electrons which can hang out on that outer ring. These electrons are not tightly bound to the atom, and can move around between atoms more easily. We call these “free electrons” and they are really what is moving when we talk about electricity! But the action is not what you might expect. We see an electron pop out at the other end as a result of pushing a new on in. All of the electrons in the tube only moved a small amount, but we see the action immediately on the other end. Wow! Cool stuff! Just as we discussed when talking about our digital gadgets, atoms have no clue what is going on around them. They just sit there watching over their private swarm of electrons. If a few free ones come by and seems to stick around, the atom is more than happy to pitch them away, so some other atom can deal with them. This idea led me to wake up in the middle of the night with a game idea we can play to show how electricity flows.